Want to learn how to program in C++ immediately? Want to start writing better, more powerful C++ programs today? Accelerated C++'s uniquely modern approach will help you learn faster and more fluently than you ever believed possible. 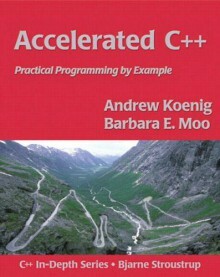 Based on the authors' intensive summer C++ courses at Stanford University, Accelerated C++ covers virtually every concept that most professional C++ programmers will ever use -- but it turns the "traditional" C++ curriculum upside down, starting with the high-level C++ data structures and algorithms that let you write robust programs immediately. Once you're getting results, Accelerated C++ takes you "under the hood," introducing complex language features such as memory management in context, and explaining exactly how and when to use them. From start to finish, the book concentrates on solving problems, rather than learning language and library features for their own sake. The result: You'll be writing real-world programs in no time -- and outstanding code faster than you ever imagined.